Having really enjoyed doing the Higher Photography course at the West Highland College I decided to spend a bit of time going through the 30,000 digital images on my PC to try and distill them down to a manageable number of what I think are my best images. The results are now available to view on my Portfolio pages. Now I find myself looking for another project. So since I really enjoyed the Crofting Cultural Landscape project I did for my Higher I have decided to take a wider look at this very broad subject across a much larger area. The Higher project was restricted to the Balmacara Estate where I live and work and the focus was definitely on the crofting elements in the landscape. For this new project I think I want to take a wider view. This concept is to a large extent inspired by work I have been doing in my day-job on the Wester Ross Biosphere. In April this year UNESCO designated the whole of Wester Ross a Biosphere Reserve under their Man & the Biosphere Programme. I have been heavily involved in getting this exciting initiative set up and hope to continue to be involved in its development over the coming years. As a result I thought it might make a good study area to focus on for a photographic project and since the MAB Programme is not just about the biodiversity of an area but also about the communities who live and work and there, and the inter-relationships between them I think it ought to fit very nicely into the same sort of concept as I applied at Balmacara. 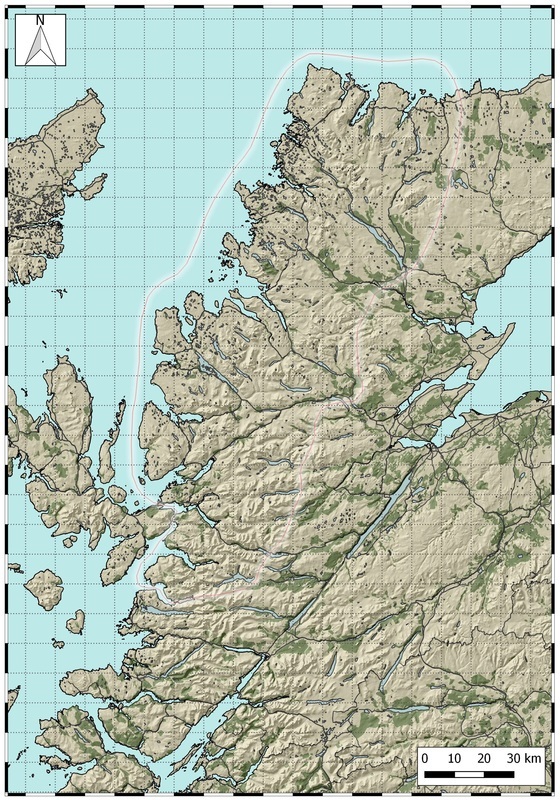 However, I also have a very real love for the far north-west, particularly Assynt and this area is not included in the Biosphere, so I have decided to include that area in my project as well. With this in mind I have drawn up a simple map showing the provisional study area (below) and while this will inevitably be a working boundary which may change over time it makes a good start. The scope that this study offers in terms of photographic opportunities is enormous and it is very likely to take a log time to complete, if indeed it can ever be completed. I have allocated 2 years to undertake the study with the aim of capturing something of the relationships between man and his environment in this fantastic landscape. Perhaps it might lead to the production of a photo book, that would be nice. Meanwhile this page will act as a virtual sketchbook, or record of my development ideas for the project as I proceed. I will post some of my thoughts, inspirations and ideas and provide regular updates on progress. I welcome thoughts and responses from readers so if you have any ideas for the study that you would like to contribute feel free to comment, particularly if you know of any locations, activities or people that would be worth considering as photographic subjects. ﻿So, after a couple of weeks of excellent weather and plenty of scope for getting good photos I have decided it is time to get started on the development and research work for this project. I thought I would start by taking another look at the project I did for my Higher Photography earlier this year (click here to see it without the full-size final images). In many ways it was this project that has inspired me to try and go to the next level and undertake a similar project, conceptually at least, for the wider west Highland mainland area. Some of the inspirations I used for that work will be equally relevant here, e.g. Ansel Adams and Paul Strand, but I also want to seek out new ideas and approaches to the art of photography for this project. Also, while I knew the study area for the Higher really well, i.e. the crofting areas of the Balmacara Estate, where I work, I certainly do not have as intimate a knowledge of the wider west Highlands. Admittedly I have traveled widely and frequently around the area since I was a child, and I have also been involved professionally in many parts, the detailed knowledge is much thinner. So against this background, I am off to start trawling the internet for inspirations and ideas and to do a bit of a brainstorm/mind map exercise to get things rolling.